I'm especially curious, have you done lactate or metabolic testing? If so, what did you find, and how did you use the results to improve your training? What are the different kinds of lab testing available? What are the benefits and drawbacks of those different kinds of tests? What’s the protocol for doing a lactate test? How do you set training zones based on a lactate test? How is it better than field testing? Why do we do much work at that aerobic threshold? What about if you’re focusing on the shorter distances – Olympic and sprint distance races, is the aerobic threshold still as important? How do you then work with the results that you get for an athlete after a lactate test? How do field tests like the 20-minute functional threshold power test and the calculations to get your 5 or 6 zones stack up against a lab test? For whom is lab testing extra important? Can some athletes skip it or is it a must for any athlete? Do you think that there’s a reason to test more frequently for Ironman athletes? What is a fat metabolism test? How is it relevant to long-course triathletes? What do you get when you do a fat metabolism test? How do you then use that to establish where you are in terms of Ironman racing? What should athletes consider when they seek out a lab? Are there differences in what different service providers offer in the quality of their services? Which is better, a lactate test or a metabolic test? 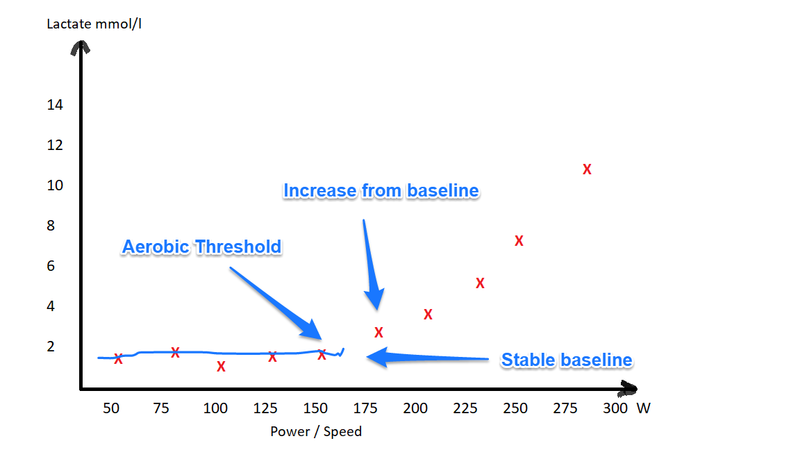 How do lab tests compare to classic time trial field tests like a 20-minute Functional Threshold Power test? This has been around for some period of time now. It's a very standard lab test. Athletes can even buy their own portable units and do the test. You do a ramp test were you start from a very low intensity, and every 5 minutes or so, you increase the intensity with a set amount. At each stage you take a blood sample from which blood lactate can be measured. This utilizes a metabolic cart to analyse your respiratory exchange ratio: oxygen intake versus CO2 production. With it, you can assess how much of your energy used comes from carbs and how much comes from fats. Generally, this testing is more in the domain of research institutions, hospitals, and universities, those who can afford the metabolic carts. Some labs do critical power testing with athletes. And many athletes are doing these kinds of field tests on their own as well. Lactate testing is a really useful window into an athlete’s physiology at any one point in time. When you look at a lactate test, you get a particular curve that’s really specific to that athlete. It’s very helpful in terms of identifying particular training zones. You can set objectives as to where you want to target the training within specific power or pace zones for the next training block and moving forward. Example lactate test results from three different tests - from Alan Couzen's post "Time for a lactate test?" My preferred way of doing it is with fairly long stages of around 5 minutes and starting at a very low intensity. Athletes have a tendency to start at a higher level with a higher power output. That is where a lot of lactate testing goes wrong. It’s very important to be conservative with the first stage that you do. 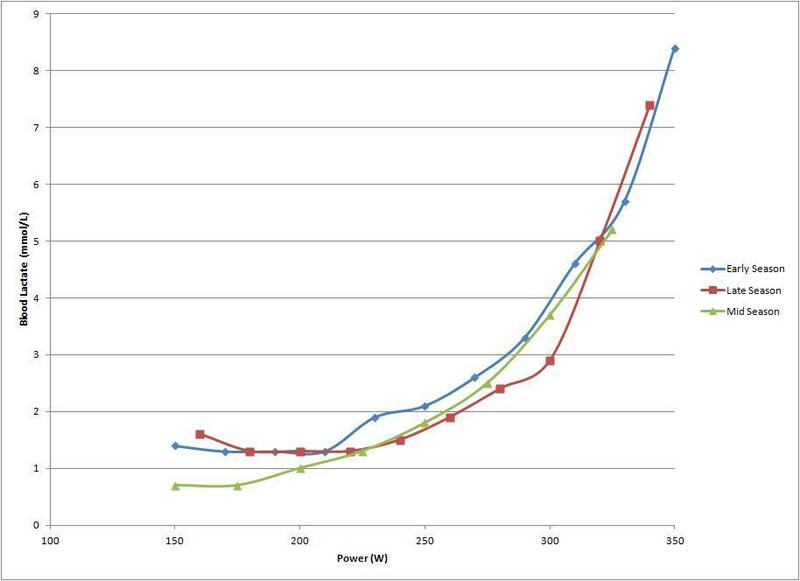 Generally, with athletes that I’m working with, that’s somewhere around 50% of their functional threshold power. Then you progressively ramp up every 5 minutes depending on the level of the athlete and how high the test is going to go. We might be ramping 15-30 watts per stage. You ramp the pace or the power and then you stay at that specific intensity for a while. At each point, you draw a blood sample and then analyse it to see the lactate concentration. That is then what you plot against the power or pace output. That’s where you can get those inflection points. The way that we set training zones is based on where those inflection points on the curve occur. The first and most important inflection point is the first point where the curve goes from a flat line to starting to ramp up. Generally, when we start the test for the first two or three stages, the athlete’s lactate would be 1.5-1.7 millimoles. At a certain point, the lactate will start to ramp up. At that point, we call it the aerobic threshold. This is a really critical point for setting training intensities. We do a lot of work in and around that aerobic threshold. The aerobic threshold tends to line up really well with the maximal fat oxidation numbers. If we’re doing a lactate test, we’re also getting metabolic data. Generally, that aerobic threshold tends to line up with where the athlete is burning the most fat. Because of that, they tend to be able to do a lot of work in and around that intensity. It’s well fuelled because we have a lot of energy reserves in the form of stored fat. It’s a good balance point between high enough intensity to be getting some aerobic benefit at the slow-twitching, fast oxidative fibres but still low enough that we’re fuelling it in a way that’s very sustainable for the athlete. This translates well to the kind of demands that an Ironman race has. The volume is important irrespective of the athlete’s specialized duration. Similarly, for a large part of the training year, the pure volume - the aerobic base - is something that’s very important for all endurance athletes and even to 800-meter track runners. That aerobic base is still something that makes up a large portion of the energy generation for the event. This is a critical area to spend a lot of time on. This is a good lead-in to the other forms of testing like the metabolic testing. When we do a metabolic test with an athlete, we also get ventilatory markers of where the ratio between the VO2 and VCO2 changes as we do the progression up through the stages. The ventilatory threshold (VT) of the first change that we see occurs a little bit beyond the aerobic threshold. That’s the first zone marker that I use with the athletes that I’m working with. Usually, that zone lines up well with the athlete’s maximal fat oxidation. 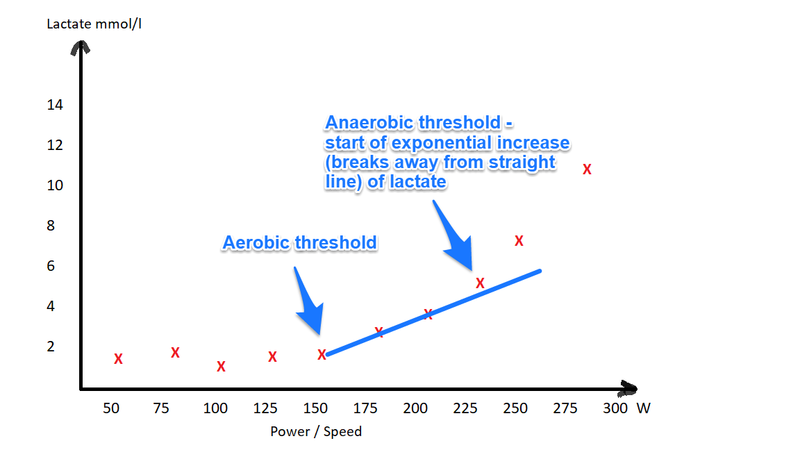 Beyond that, we start to look at the anaerobic threshold for the athlete where the blood lactate makes its second rise. This is another critical point because it limits the steady-state intensity of the athlete when we’re setting longer intervals and doing tempo work. We want to focus on it just a little bit before that point. Essentially you have three zones. You have one below the aerobic threshold, one in between the aerobic and anaerobic thresholds, and one above the anaerobic threshold. They do not stack up well against a lab test because those tests even at 20 minutes have an anaerobic component. A lot of serious, high-level athletes put their best 20-minute numbers very early in the season. Those tests tend not to line up as well as with when the athlete’s aerobic threshold numbers and race-specific power numbers are at the highest. I see almost an inverse relationship where the best 20-minute test happened close to the off-season when the athlete is fresh and ready to give a good anaerobic effort. The 20-minute test has its appeal because it tends to give athletes a higher number than what a lab test would give them. Generally, if we compare it to a lactate test in the lab, it is higher. It’s inflated for most athletes. This is more of a question of frequency. It costs $150-250 for a metabolic test. It’s certainly not a thing that you’ll be doing for every single block of training. It’s good to always check in on the metabolic status of the athlete at least once a year. It also depends on what we find. If fat burning is a weakness that we want to improve, then we might want to do this test more frequently. Ideally, the lactate curve changes every block. We identify zones on the curve that we want to address for a given block of training and we have an idea of how we want the curve to change. It’s always useful at the end of the block to do testing to see if we’re seeing what we wanted to see. With lactate, in particular, it’s more accessible. You can buy a good portable lactate tester for a couple of hundred dollars. You can plan with your buddies a testing day once every month or once every couple of months to test each other. It’s an affordable way of doing it. It’s not that hard once you get a few key techniques with lactate sampling. This is something that gives the athlete a lot of visibility into their training. For Ironman, the important thing to be aware of is that it’s really a test of metabolism more than fitness. You can see athletes making the jump up from short-course racing to Ironman and a lot struggle despite being very aerobically fit athletes. There’s no immediate guarantee that just because you’ve got a very high VO2max or threshold that you’re going to be a good Ironman athlete. The reason for that is that the event is fundamentally metabolically limited. You need to be able to fuel the effort that you aim to sustain for the race. 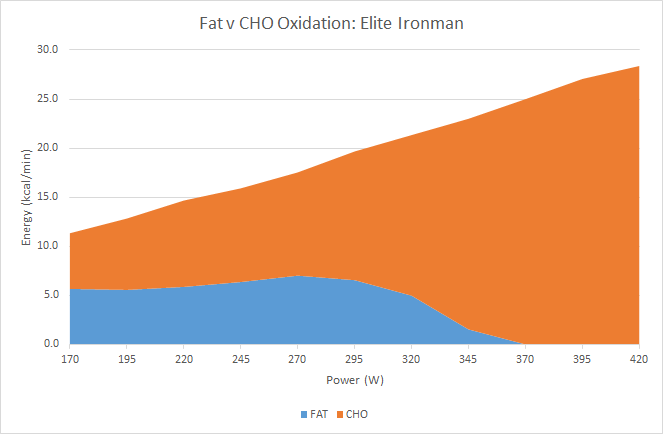 Knowing where you are currently with respect to that and being able to compare that as a benchmark in the same way that we compare your functional threshold power with typical numbers for Ironman athletes is very useful. On the metabolic side of things, it is very important for an Ironman athlete to know where his or her fat burning currently is. How I like to view the test is that I have a lactate curve in the foreground and in the background I’ll have a stacked diagram showing the amount of fat burning of the athlete shaded for each of those power zones as the test goes up. You’ll see a nice little fill of how much fat the athlete is burning through each power zone. You can then compare that to the training zones that are coming from the lactate test. You can see not only on the Y scale how high the fat burning goes and how much fat burning the athlete has, but also on the X scale how much fat they’re burning in those key race intensities. That distinction is really important because a ketogenic diet can really elevate that Y axis. You can see athletes who are burning 10-14 kcal of fat per minute which suggests an insane amount of fat burning. The key question really is how much fat is the athlete burning in their race intensities? That’s what we want to maximize for Ironman athletes. Example metabolic test results for an elite Ironman triathlete - from Alan Couzen's post "Getting your 'fat burning' tested: Part 2: Analyzing and interpreting your results." The first important consideration is the quality of the equipment that is being used. We’re now at the point where a lot of this metabolic testing is starting to trickle down to health clubs and smaller labs. Some of them are okay but some have a really hard time handling the flow rates and volume that we see even in average level athletes. My suggestion for athletes is to go to colleges that have an exercise physiology department or to hospitals. These are the kind of places that can afford the $20,000-30,000 good metabolic carts. The second important thing with the lactate test is being willing to start at a very low level of intensity and to do those longer 5-minute stages for the test. It’s a balance between the lab wanting to make money in keeping the test short and you getting good results. It’s important to find a lab that is willing to run the protocol that is going to give you good results. It’s definitely worthwhile to get metabolic data once a year. You will be hitting two birds with one stone. You’ll get both metabolic and lactate data in a metabolic test. Without the metabolic cart, you won’t be getting those fat burning numbers which are really important, especially to Ironman athletes. 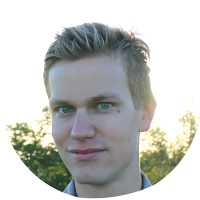 ​In terms of resource, it would be the athletes that I coach where I get most of my information with the experiments that I do with them. Hope you enjoyed that episode everybody, and thanks to Alan for being a great guest! I myself have never had a lab test done on me, although I have been involved in conducting lactate tests as part of a coaching course. It makes a lot of logical sense that when using field tests of limited duration at a max effort like 20-minute FTP-tests, the anaerobic component involved inflates the numbers. And it is also a fact that what your aerobic threshold is as a percentage of your anaerobic threshold varies a lot from individual to individual. (See episode 71 for more on this topic). And I already recommend for Ironman athletes I coach that if they have the budget for it, go and get at least a baseline metabolic or lactate test done. The return on investment in how precise the training will be for the demands of their Ironman is worth it.